The State Herbarium‘s journal was renamed from Journal of the Adelaide Botanic Gardens to Swainsona this year, as we announced a few months ago. The journal’s web-site has now been changed and updated to reflect this name change. It can be accessed using the new web-address flora.sa.gov.au/swainsona. The Volume numbering will continue. This year, it is planned to publish two volumes of Swainsona: Vol. 30 of the renamed journal will contain the Proceedings of the Botany Symposium at the 2016 NRM Science Conference and will be published later this year. Regular papers are published in Vol. 31. Papers are published electronically as soon as they are reviewed, edited and typeset. A hardcopy volume is printed at the end of the calendar year or beginning of the next year, collating all articles published during this time. Printed volumes are distributed to botanical libraries around the world and are also available for purchase. The journal is also available through JSTOR. Leptecophylla pogonocalyx subsp. decipiens, a newly described subspecies from Tasmania. Photo: J.A. Jarman. Today, the State Herbarium published four regular papers in the online version of Vol. 31 of Swainsona. In this article, the occurrence of Leptecophylla juniperina in Tasmania is reviewed by two botanist from the Tasmanian Herbarium. Two subspecies of this taxon are re-instated to specific rank and the new combinations published: L. oxycedrus and L. parvifolia. Leptecophylla juniperina itself is excluded from the Tasmanian flora. Tasmanian plants previously identified as L. juniperina are mostly either L. oxycedrus or the newly described L. pogonocalyx subsp. decipiens. An identification key is provided for Tasmanian species of Leptecophylla. Smardaea australis, a new small black disc fungus from Kangaroo Island. Photo: D.E.A. Catcheside. The authors from the State Herbarium and Flinders University describe a new species, Smardaea australis. 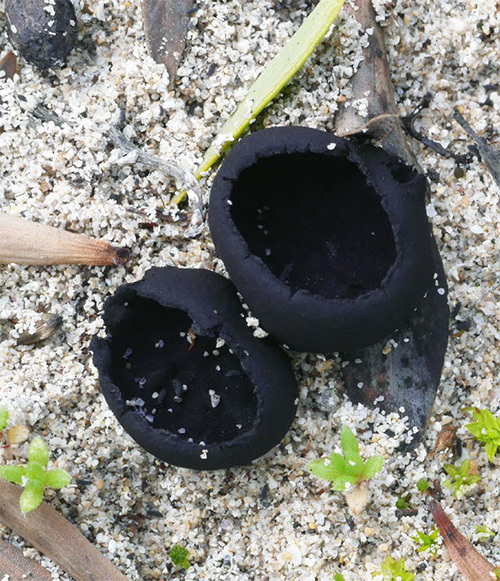 This small black fungus is known from five collections made between 2001 and 2014 in South Australia and one older specimen from Victoria. This is the first record of the genus Smardaea in Australia. The phylogeny of Smardaea and Marcelleina, both genera of violaceous-black discomycetes having similar morphological traits, is also analysed and discussed. 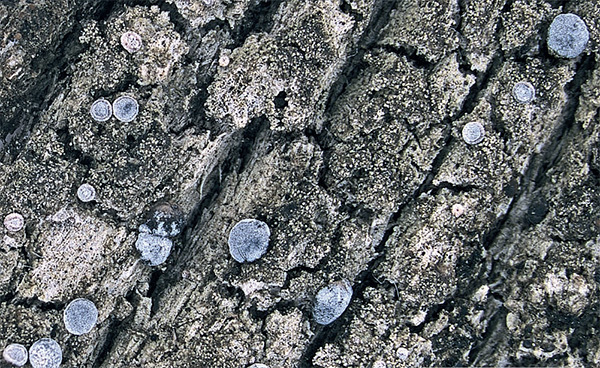 Lichenologists from the Tasmanian Herbarium and the Australian National University describe a new species of the genus Tephromela, which contains very unusual chemical substances. Many species of the genus are characterised by their metabolites. Alternariol and 9-O-methylalternariol occur very rarely as major metabolites in lichens and are known as such only in the unrelated species Pertusaria praecipua from Papua New Guinea. Bacidia brigitteae, a new lichen species from Kangaroo Island. Photo: G. Kantvilas. The author continues his research on lichens from Kangaroo Island with this paper reviewing two species of Bacidia, one of which is described as new. Both belong to a group in the genus with pruinose apothecia. To access content of all volumes of Swainsona and the Journal of the Adelaide Botanic Gardens since Vol. 1 (1976), please visit the journal’s web-site at flora.sa.gov.au/swainsona. This entry was posted in Publications on 15 June, 2017 by Jürgen.